In her coaching and programs for women, Tara Mohr saw how women were "playing small" in their lives and careers, were frustrated by it, and wanted to "play bigger." She has devised a proven way for them to achieve their dreams by playing big from the inside out. Mohr’s work helping women play bigger has earned acclaim from the likes of Maria Shriver and Jillian Michaels, and has been featured on the Today show, CNN, and a host of other media outlets. Sheryl Sandberg’s Lean In gave many women new awareness about what kinds of changes they need to make to become more successful; yet most women need help implementing them. In the tradition of Brené Brown’s Daring Greatly, Playing Big provides real, practical tools to help women quiet self-doubt, identify their callings, “unhook” from praise and criticism, unlearn counterproductive good girl habits, and begin taking bold action. While not all women aspire to end up in the corner office, every woman aspires to something. Playing Big fills a major gap among women’s career books; it isn’t just for corporate women. The book offers tools to help every woman play bigger—whether she’s an executive, community volunteer, artist, or stay-at-home mom. Thousands of women across the country have been transformed by Mohr’s program, and now this book makes the ideas and practices available to everyone who is ready to play big. Tara Mohr has an MBA from Stanford and an undergraduate degree from Yale. Mohr has been a columnist with the Huffington Post since 2010 and has been featured on the Today show, in MORE, ForbesWoman, Harvard Business Review, Whole Living, The Financial Times, and numerous other media outlets. She lives in San Francisco. "At last. At last this very important book has been written, encouraging women to take up all the creative space they deserve in the world. I hope it will empower legions of women to step into their greatness. I couldn't be happier about this publication." "Tara and I share the same philosophy: we hope inspirational ideas will ignite you to go out and make an impact in your own life. Whether she’s writing for mariashriver.com or urging others to become a change agent through her book, Tara is practicing the Playing Big words she preaches." 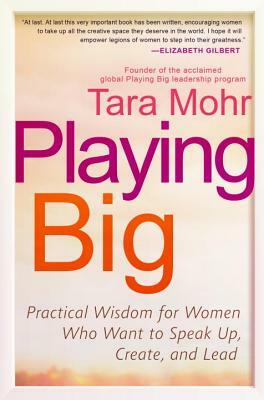 "Tara Mohr offers a new model of leadership, one that acknowledges and embraces the complex realities of women's lives. She shows us how to take the leap, even when we don't feel ready. Playing Big is the perfect catalyst for any woman who wants to go outside her comfort zone, find her voice, and embrace the biggest possibilities of her life." "While reading Playing Big I kept thinking of the many people I knew (men too!) who would love it. With clarity, warmth and deep wisdom, Tara shines a light on our blocks to manifesting our potential, and offers practical, well-honed strategies that move us toward fulfillment. This is a book that can transform the trajectory of your life." "Tara Mohr shows us how to replace self-doubt, inadequacy, and worry with confidence, self-worth, and courage. She is a brilliant writer and teacher whose warmth and passion fill these pages. Full of examples and practical tools, this is a gem of a book." "Don't try to change the world before you read this book! In Playing Big Tara Mohr offers you the keys to unlocking your gifts, your potential and your power to make a difference. I guarantee that you will find yourself and your dreams somewhere in this book and when you do Tara's deep insights, her practical action steps and her real life stories will set you free." "Luminous, deep, and practical. I've asked every woman in my all-woman company to put Playing Big first on their reading list. We want to make a difference in the world, we want to live full-on, and we know that our passion is powerful. We need this! Playing Big is like a torch that shows you where assumptions you've been holding could be holding you back -- even if you think you're using your power to the fullest." "For anyone who's afraid they don't have what it takes to live a bigger life, Playing Big shows you unquestionably do. Thought-provoking coaching and exercises help us access our existing inner resources by grounding us in reality and possibility instead of fear. Mohr's goal is not about getting the next promotion (although that may come too) but something much more lasting and limitless: true empowerment from the inside, and the capacity to change the world." "When I was at a critical career juncture, I took Tara's online leadership course and it was transformative. After just three sessions, I had decided to quit my current job, start my own consulting practice, and follow my passion around developing leadership for large-scale social impact. While I'd already had some success, Tara's work was instrumental in helping me find my own inner calling, unhook from other's expectations, and start playing really big. Her book captures the key lessons of the course in a compelling format, and is sure to help countless women and social entrepreneurs achieve even greater impact in the world." "This is the how-to manual we've been waiting for. Tara cuts through our playing small strategies with every brilliant word and liberating idea. This book will be passed from friend to friend, given as a graduation gift, and lauded in women's lists of 'books that changed my life.' May this powerful book help us create a more just and happy world." "If you've ever struggled (as I have!) with feeling like you have so much more to offer the world yet are unsure of the next step, Playing Big will give you the road map. Chapter after chapter I felt Tara was speaking directly to my soul... there's not a trick for hiding and playing small that she misses. Tara's tools will help you excavate your voice, clarify your mission & message, and fuel yourself renewably from the inside out. Playing Big is a must read for every woman with a dream." "There's nothing small about Tara Mohr's Playing Big. Deeply insightful, well-researched, and action-packed, Playing Big is destined to become a part of the canon on women's leadership, right alongside Sheryl Sandberg, Brené Brown and Arianna Huffington." "Playing Big enables the modern day woman at ANY age to face her career and life with a sense of curiosity and confidence rather than fear and regret." "I have been searching for a book to recommend that will solve the epidemic in women of thinking they're not enough. Playing Big is that book. It's an answered prayer for me and women all over the world. Smart, practical, profound, and heart centered—Tara Mohr nailed it"
"Tara has her finger on the pulse of what holds too many women back—and, even better, she's got concrete tools to help us face the fears that keep us from seizing our potential. If you’re ready to look inside and claim your power and potential, this is the book to read, and the partner to work with." "I have seen hundreds of women with big dreams get stuck behind wall of fear just as they are about to create something great. Playing Big holds the key to gently and firmly pushing down the wall so that no woman is held from her rightful destiny." If you have difficulty accessing content on this website, please contact us at 970-926-7323 and we will strive to assist you in accessing our website.